The Craft Barn alpha/dictionary challenge is asking for the letter D with a twist of pink. I am using a wildlife encyclopedia, and trying to find creatures I never heard of before... so let me introduce you to the dugong that lives a quiet and secluded life eating seagrass on the seafloor. It is the only totally herbifore sea mammal on this planet! The dugongs live on coastal areas all the way from western Africa to Australia. Their closest relatives, manatees, live on the other side of the African continent and the northern part of South America. I used a Tattered Angels spray for the blue background. It shimmers nicely, though the photo doesn't show it. I forgot that the cardstock I'm using for these doesn't really take sprays very well, but the blown surface acts like bubbles... I added some old book paper for the bottom of the sea and stamped pink seagrass (using a stamp that depicts sewing stitches!). 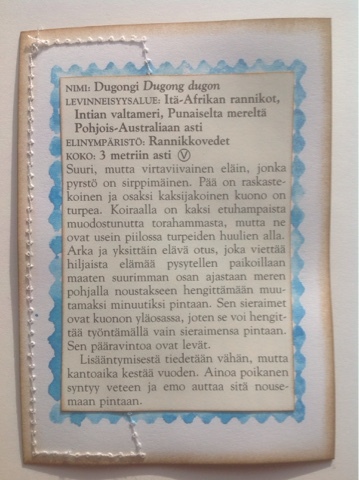 I'm sure she doesn't mind a pink meal today :) Here's the back of the card with the description in Finnish. Want to learn more, but still don't read Finnish? No worry, check out the ever reliable wikipedia! All the stamps I used are from Rubber Dance Art Stamps. Another wondrous animal to add to your collection! The page is wonderful and a great interesting animal. I thought at first he was a manatee. What a fabulous creature and a lovely page. Great page and very educational too - thanks for that! Wouldn't he be quite a good character in a Disney movie. I can imagine his deep voice pouring out his wisdom. Fantastic illustration. Love the stitching you added. Another wonderful creature! At the end of this challenge you are going to have a very diverse zoo! What I love about this challenge is I learn SO much when I visit you. Words I've never heard before and animals I've never seen. What a fantastic choice, unique, and unusual. 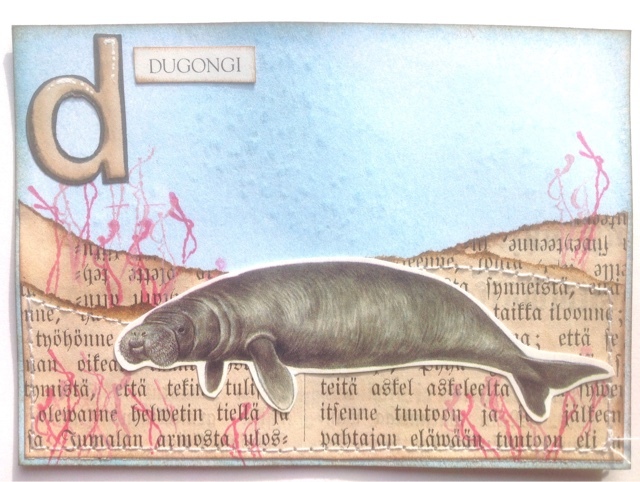 I'm fairly certain no one else will come up with a dugong as their choice of D words! Thank you for introducing me to your dugong, I have never met one before! Love those pink sea grasses too. This was a great idea for the "D" challenge. A great use of the sewing stitch stamp. Another fabulous project!! Love it! Thank you for joining in The Craft Barn Challenge.